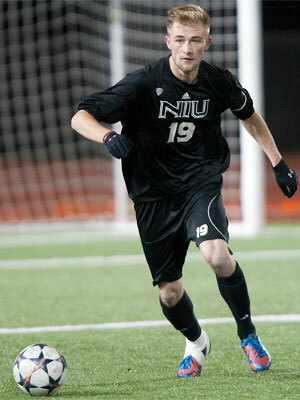 Senior captain Dusty Page (Germantown, Wis./Kettle Moraine Lutheran) scored in the 61st minute as the NIU men’s soccer team tried to rally from a 2-0 halftime deficit, but it wasn’t enough as the Huskies fell to Bowling Green on Saturday night at the NIU Soccer Complex. With the loss, NIU finishes the season with a 3-9-5 record, 0-4-1 in Mid-American Conference play, Bowling Green improves to 13-5-1, 2-2-1 in the MAC, and qualified for the conference tournament. 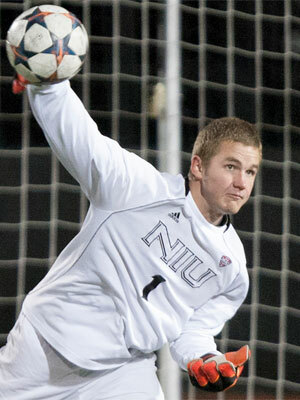 “I thought tonight was a microcosm of our season,” said NIU head coach Eric Luzzi. Freshman midfielder Len Heinson (Wuppertal, Germany/Carl-Fuhlrott Gymnasium) had the first shot of the game in the 11th minute, pushing the ball to the left of the post with his right boot, after collecting a 50-50 ball inside the 18-yard box. Senior Andrew Palumbo (Ft. Myers, Fla./Bishop Verot/Darton College) put the first shot on goal in the 28th minute, working up the left side of the box and cutting to his right to force the keeper to make a diving save and force a corner kick. Bowling Green was able to clean the ensuing corner kick. The Falcons struck first in the 33rd minute as Joe Sullivan received a through ball from midfield for a one-on-one attempt with NIU goalkeeper Andrew Glaeser (Walla Walla, Wash./Walla Walla/Oregon State). Sullivan took three touches into the box, forcing Glaeser off his line, and curled the ball high into the back of the net at the far post to make it 1-0 Falcons. Bowling Green added a second goal five minutes later as Max Auden one-timed a ball from inside the 18-yard box after collecting a through ball from midfielder Ryan James to put BGSU up 2-0 before halftime. After the break, Page cut the NIU deficit in half in the 61st minute as the Huskies earned a free kick just in front of their own bench. Sophomore defender Richard Hall (Billericay, England/The Billericay School) took the free kick and sent a hard in-swinging ball to the far side of the box to Page, who settled with his chest, took a touch and swept the ball past the keeper and into the far post to bring the Huskies within one, 2-1. Following the captain’s goal, NIU led a spirited effort to attempt to draw even with the Falcons, maintaining possession of the ball in Bowling Green’s half for most of the final 29 minutes. 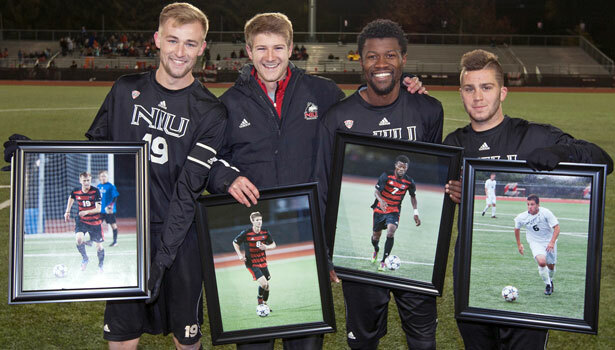 But NIU was only able to muster one more shot as freshman midfielder Giovanni Garcia (Chicago, Ill./Elk Grove) pushed a ball over the net in the 77th minute. Saturday’s contest marked the final game in the careers of Huskie seniors Palumbo, Page and Isaac Kannah (Plymouth, Minn./Prairie Seeds Academy), along with injured senior Shawn Vroom (Kohler, Wis./Kohler), who did not see action.